Does it feel like the pantry renovation is dragging on? Well, I have good news, this is going to be the last post before the wrap up post. 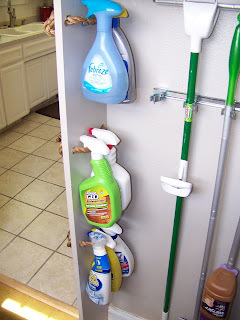 If you remember back a few weeks, I wanted to find a way to store cleaning sprays on the wall that boxes in the storage nook. 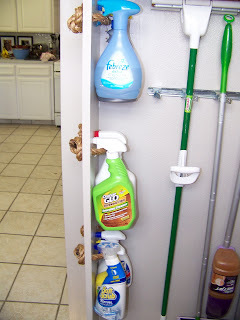 Our new drawer handle pulls gave me the idea to use the same rope to create a hanging system for our cleaning bottles. 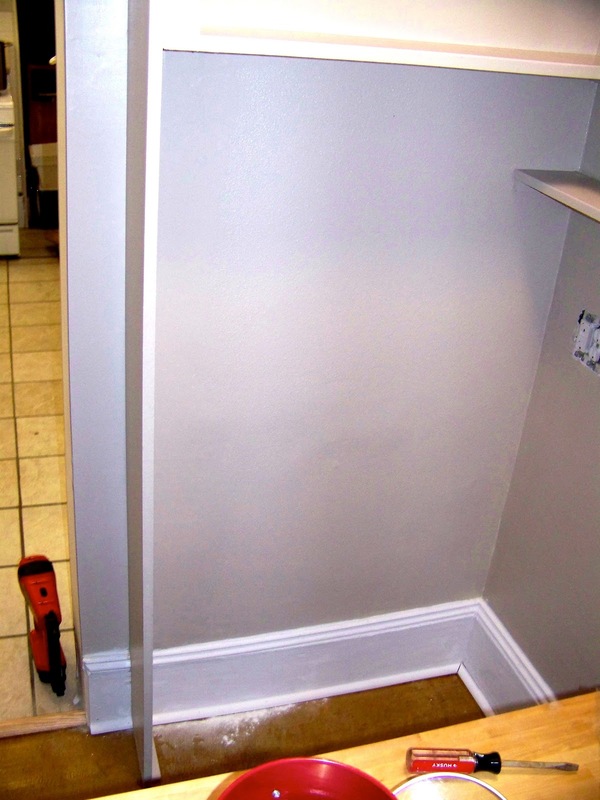 We simply drilled holes in our wall using a 3/4 inch paddle bit. We fed the 5/8 inch rope through the holes with the electrical tape on the ends to keep it from fraying. 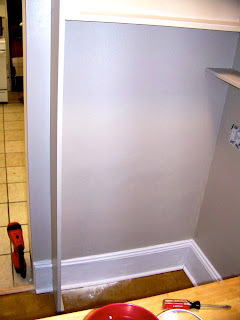 Then we tied off the ends and took the tape off so we had three nice rows of hanging storage. Each row can hold 3-4 bottles which allows us to store all of our cleaning spray bottles right next to all the rest of our cleaning supplies. Originally I was going to try to use a hanging shoe holder as my storage on this wall but because it is so narrow, the ropes allow us to store many more bottles then the hanging shoe storage would have. Now we can check one more thing off our list of things that didn't have an away place! inking To: Hi Sugar Plum, The Great Indoors, House of Hepworths, My Repurposed Life, Our Delightful Home, Five Days Five Ways, Serenity Now, Lovely Etc., The Rooster and the Hen, Six Sisters Stuff, Tatertots and Jello, Wayward Girls Crafts, Twigg Studio, Serendipity and Spice, Ask Anna, Home Stories A to Z, Uncommon Designs, House wives of Riverton, Crafty Texas Girls, Southern Institute, Watch out Martha! Very clever way to store them. thanks for sharing. That is brilliant! I think I might try this-thanks for the idea. No problem. I'm glad you like it! Can't wait to see the final-final post...ha ha! makes it sound like I'm sick and tired of it...but NO~ I have a short term memory problem; I think I forget all the goodness that has gone into the little walk in cupboard. Not to mention...PANTRY ENVY! What a great idea!!! I'm going to try this and clear out the mess under my sink! I absolutely LOVE this! Great idea, genius I tell ya G-E-N-I-U-S! I'd love for you to link up to my first ever linky party, Ta-Da Tuesday :) check it out HERE ! <3 from your newest follower, I'd be delighted if you'd follow back! Fantastic! Mine are just thrown under the sink- a HOT mess! This is a fantastic fix! Thanks for linking up and sharing! !